On Monday, Clinton - who is now weighing another run at the presidency in 2016 - was asked during a Facebook question and answer session whether she would "support a constitutional amendment" to overturn the Supreme Court's "Citizen's United" ruling and limit the amount corporations and outside influences can contribute to political campaigns. "I would consider supporting an amendment among these lines," Clinton responded. "That would prevent the abuse of our political system by excessive amounts of money if there is no other way to deal with the Citizen's United decision." The 2010 Citizens United decision opened the floodgates for outside money in politics and ballooned the amount spent on campaigns. Even though Clinton has said she wants to limit money in politics, people close to her are preparing to raise massive sums for a possible presidential bid. Some of her biggest 2008 donors told CNN in January that they are waiting for her decision on whether to run with open wallets, while a cadre of outside groups – many of whom were created because of the Citizens United decision – have begun to raise money in order to be helpful to her possible candidacy. Although many pro-Clinton Democratic operatives say they wish big money was not a part of politics, the pro-Clinton groups have embraced the law. "You have to play the game with the rules as they are," said a source at Priorities USA, a group that plans to raise big money to support Clinton if she runs. "We can't unilaterally disarm." Many of Clinton's 17 Facebook answers dealt with substantive issues. On violence in the Mideast, she wrote that she hoped "there can be a ceasefire soon to end the conflict" and was "fully supportive" of Secretary of State John Kerry traveling to Egypt in a bid help broker a deal. She also wrote that her first move as President, should she run and be elected, would be to "grow the economy, increase upward mobility, and decrease inequality." But like many Facebook posts, some were less than serious. She agreed to sign two copies of "Hard Choices" - her new memoir - and in a response to "Rufus Doggetti," Clinton wrote that, yes, from time to time she does let her dogs on the sofa. She also wrote that her favorite book was "The Brothers Karamazov" by Fyodor Dostoyevsky and that the first book she would read her new grandchild would be "Goodnight Moon" by Margaret Wise Brown. And in the category of substantive in the future, Clinton offered this nod to the first-in-the-nation primary state: "I love New Hampshire!" In addition to sitting down for Facebook questions, Clinton toured the company's Menlo Park, California, headquarters. She spent the morning at Google and participated in a conversation with company employees. 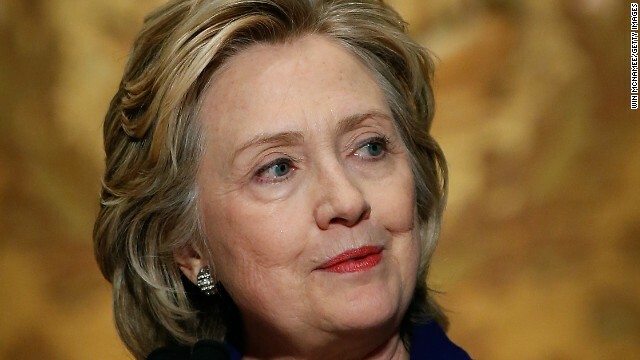 Clinton also had a live-streamed conversation with Twitter staff, where the former secretary of state was interviewed by Katie Stanton, who spent six months working for the Clinton State Department in 2010 when she served as special adviser to the Office of Innovation. Clinton fielded questions on college affordability, women in leadership and her 2016 aspirations. Many of the questions were asked by Twitter staff and famous Twitter users. She heralded the role of social media, but said she hoped in the future that "we would see a maturing of the use of social media, not just to score points ... but to try to create space for real conversations." Clinton also tacked to her party's left on college affordability, an issue many progressives and liberals have heralded as critical. "Too many young people are being priced out of going to college or staying in college," Clinton said. She later added, "I think it is one of the biggest problems we have in the country. College education just costs too much. It is hard to relate the rise in cost to the actual product that has certainly changed somewhat, but not so dramatically as to justify those costs." Clinton sidestepped a query from soccer star Julie Foudy about who Clinton's running mate would be if she ran in 2016. "I think Julie has been a tremendous soccer player but I am not ready to answer her question," Clinton said, "because I am not even ready yet to say that I am going to do it or that I would get it done." Yes she would.. AFTER she is voted in.!! And its simple math. Large sums of money is being donated to PREVENT her from taking office. Her book is NOT selling to fund her run. And suddenly her speaking tour money has dried up faster than water resivor in southern californias drought! So of course she would pass a amendment to prevent it again on her SECOND want for the round room later. Its killing her chance at twirling the leather chair the first time..
Wonder if she would limit an amendment limiting the amount of bribery I mean speaking fees that she, Bill, and Chelsea can get??? Hillary has just now come to this conclusion after they are all washed up however it should be after the next election cycle or two ? Yes thats what all democrats say about the time elections do roll around they are just ashamed and feel intence discomfort about the fact . I believe that yup . Yes we can . NO MORE SUPER PACS. The more the Rich people are allowed to give the more preferential treatment they will receive. Look at the NRA and what they have been allowed to get away with. Guns are a right in America. People owning guns and not taking care of them is not. "Responsible Gun Owner" Allowing them their guns to be stolen because they did not secure their weapon is criminal. All of these gun on our streets, in the hands of criminals end up there by so called "Responsible Gun Owner" not being all that responsible. Irresponsible drives lose their right to drive. The NRA does nothing to irresponsible gun owners, why not ? Money in a political pocket thats why. Well of course she would. She gets billions worth of free advertising on CNN MSNBC ABC CBS, and michael moore propaganda films. Must be afraid of being broke again. Concrete but not substantive. Those of us familiar with her views would find it mundane. As for Citizens United, all we have to do is treat outside groups as contributing to politics , which then limits them to $2300 per individual . Anyone donating to a political cause of any kind must limit themselves to that. Each person working for the corporation must choose individually to donate. The decision cannot be made for them via an in house vote. Yeah! ..don't blame Clinton on campaign money. it's the SCOTUS call. Excessive money corrupts excessively. This is a serious issue and one both sides should be able to agree on. The big issue with the GOP is their concern losing large donors will put them at a disadvantage somehow. For this reason Individual limits should be made in a range that is not excessive but not low enough to place the GOP, who draw from a smaller constituency base at a disadvantage. The big thing is taking corporations leverage out of the equation and placing power back into the hands of actual people. This, I believe is one of the fundamental threats and dangers to democracy and the sole reason this country could become an Oligarchy. I believe making individual limits at 25K, then prorated with yearly inflation a fair individual limit. This would keep the playing field fair for the GOP, who typically get their contributions from a smaller base but at closer to maximum amounts. When you consider the ramifications, every congressman and senator needs to ask themselves if they really want the country to become an Oligarchy. They need to look at their bank accounts and ask themselves do they really believe placing all the power into the hands of billionaires is a good idea. Because last time I checked most of Congress are not billionaires. Very interesting that was on public NATIONAL NEWS this morning. That Hillary is in the top 1% of money earnings!! Now that will be a little harder to fluff Hillarys fur without choking every day on CNN.! And the obvious LIE about being broke is now public. Lets see how the polls are skewed now since its in verifiable PUBLIC KNOWLEDGE of the smoke and mirrors of her now PROVABLE LIES.. Her ?dynasty? Is fadeing faster than the chance to go "woo-woo" in the twirling leather chair..
Yeah right, she speaks out of both sides of her mouth, on one hand she's telling everyone what they want to hear and what she's doing is the exact opposite. We need her OUT of the political arena. Some of these schools make ungodly amounts money, its not like they need to charge so much. obama said he'd take public financing and then reneged on it. the first of his long list of lies. democrats just like to talk about all the money in politics because it plays along with their other lies. but when it is time to walk the walk, they are never willing to do it. they line up all their millionaire and billionaire supporters and squeeze them for everything they can get.